While in Seattle it came to my attention that a lot of you do not know of the joy that is poutine. The standard is gravy, cheese curds and fries, but lately the poutinering has opened itself to all sorts of new combinations. Basically if it’s edible it can go on a bed of french fries. I’ve been putting off doing a big write up of Emerald City Comic Con and that’s only because I’ve been trying to find the right words to describe it. It was sort of a mixed bag. The people I met were absolutely amazing. Meeting Kris Straub was one of many highlights of the trip. Some solid new friendships have developed from this trip and current friendships only got stronger. It was by far an excellent convention people wise. My only complaint is that they had our group of webcomics away from all the other webcomics. Some people didn’t even know there was a whole other section of comic goodness. So it brought sales down friday and saturday. Sunday picked up and I’m happy to say that 75% of my book sales were to people that never even read the comic, had picked up a flyer from me the day before and then decided to buy a book. ProTip: Flyers with 6 of your broadest and best comics on it kill at conventions. So there’s a mini write up of Emerald City Comic Con. Panel 2’s speech bubble seriously reminded me of Bubba from Forrest Gump, when he goes through all the different ways to make shrimp. Also, now I really need to try poutine. I would seriously travel to Canada just for that, no lie. It’s not really poutine if it’s not made from quebec cheese curds. I don’t know what we do but they are really different from ontario’s. ”La Banquise” in montreal has one of the best poutine IMHO. I think it is from who you get it from. I know of a few places that use actual true to nature “Fresh Curds” as opposed to that over salted processed crap and forget about New York Fries cheeslike substance [it aint really cheese]. i was watching an episode of epic meal time and they made a bunch of foods, and one of them was a poutine mac & cheese, and i made one the next day at work (i work in a deli) after finding out what a poutine actually is. i had to use potato wedges instead of actual fries, but it was pretty good. You just lost all Canadians the right to ever again call an American fat. That being said, why the hell have I never heard of this, and why the hell don’t we have it here? Gravy with roasts are wonderful, but they lack “chips” and the cheese curds that make up the magical creation which is poutine. Oh how I love me some poutine. If I can make it over to Canada in July for a quick visit , I’m so visiting Smokies Poutinerie. I don’t even care for poutine usually…but Smoke’s is awesome. I get the one with pulled pork, bacon, and peppercorns on it. Today’s comic to be sung in the style of an Animaniacs cartoon. Funny that you mention that. I did it inherently. Kinda Weird Al’s song “Hardware Store”. This is one more reason why I should someday visit Canada. I doubt it would come even close if I found it (or tried making it) here in the states. Let us not forget poutine with yam fries. My heart stops most deliciously at the thought. And now I’m curious about your poster, any chance you could post it? 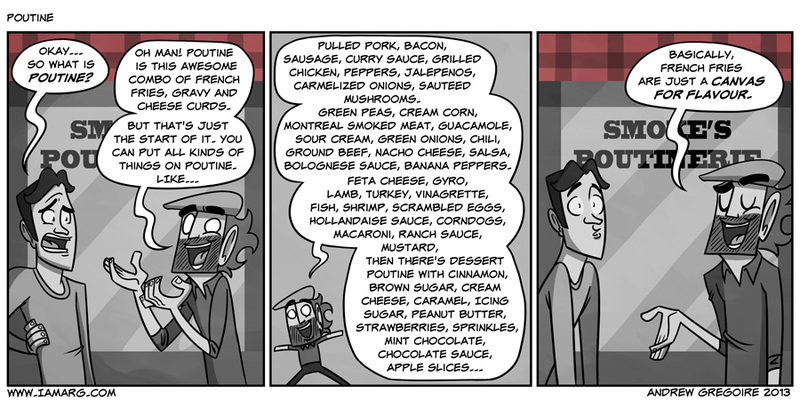 This is especially funny to me because I randomly thought of Poutine earlier today. You…You got to meet Kris Straub?…. I’m so envious. I’ve eaten my fair share of crap, but never poutine. I think it’s the cheese curds that trip me up as I usually think cottage cheese as cheese curds. Thank you for teaching me about poutine! I didn’t know about it and it seems delicious! i was a little disappointed that there wasn’t a poutine stand in the canada section of epcot..
O_O So that’s poutine! As a humble American with little knowledge of such wonderous delicacies I must eventually try this magical thing called poutine. In Rochester we have the garbage plate, in which ANY SIDE is the bed upon which flavor is delivered. French fries are par for the course, but most anything goes. They are delicious, and the nearest you can get to poutine in the US outside of bootleg American poutine joints.